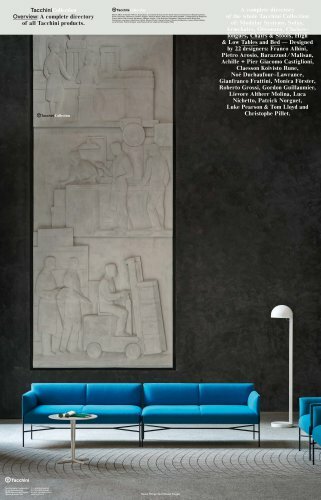 TacchiniCollection Overview: A complete directory of all Tacchini products. Tacchini Italia Forniture Srl 19, via Domodossola 20822 Baruccana di Seveso (Monza Brianza) Italy Edition 2014, format 63 × 98 cm, 81 products: a complete directory of the whole Tacchini Collection of: Modular Systems, Sofas, Armchairs, Ottomans, Chaises–longues, Chairs & Stools, High and Low Tables and Bed — Designed by 22 designers: Franco Albini, Pietro Arosio, Barazzuol ⁄ Malisan, Achille + Pier Giacomo Castiglioni, Claesson Koivisto Rune, Noé Duchaufour–Lawrance, Gianfranco Frattini, Monica Förster, Roberto Grossi, Gordon Guillaumier, Lievore Altherr Molina, Luca Nichetto, Patrick Norguet, Luke Pearson & Tom Lloyd and Christophe Pillet. Some Things You’ll Never Forget A complete directory of the whole Tacchini Collection of: Modular Systems, Sofas, Armchairs, Ottomans, Chaises– longues, Chairs & Stools, High & Low Tables and Bed — Designed by 22 designers: Franco Albini, Pietro Arosio, Barazzuol ⁄ Malisan, Achille + Pier Giacomo Castiglioni, Claesson Koivisto Rune, Noé Duchaufour–Lawrance, Gianfranco Frattini, Monica Förster, Roberto Grossi, Gordon Guillaumier, Lievore Altherr Molina, Luca Nichetto, Patrick Norguet, Luke Pearson & Tom Lloyd and Christophe Pillet.